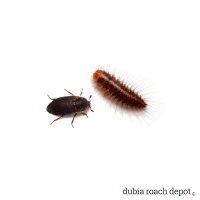 This Kit contains Dermestid and lesser mealworm beetles, larvae, and eggs for maximum cleaning in Dubia and other roach colonies. In our experience, the combination of Dermestid beetles and lesser mealworms make better cleaner crews than either insect alone. Any weakness in one species is complimented by the strength of the other, and the whole is greater than the sum of its parts. When it comes to cleaning roach colonies, Combination Cleaner Crews work cooperatively, not competitively. And the result is strongly symbiotic. Each Combination Cleaner Crew kit comes with around 30 insects: 20 lesser mealworm larva/beetles and 10 Dermestid larva/beetles. Of course, there will also be microscopic eggs as well, and we try to overstock them in case any are lost during shipment. Loss is rare, so most orders arrive with a few more insects than advertised. Both cleaner species enjoy a trouble-free, symbiotic relationship with B. dubia. This relationship works to their mutual advantage, and their proximity is a win not just for each species, but also for you. 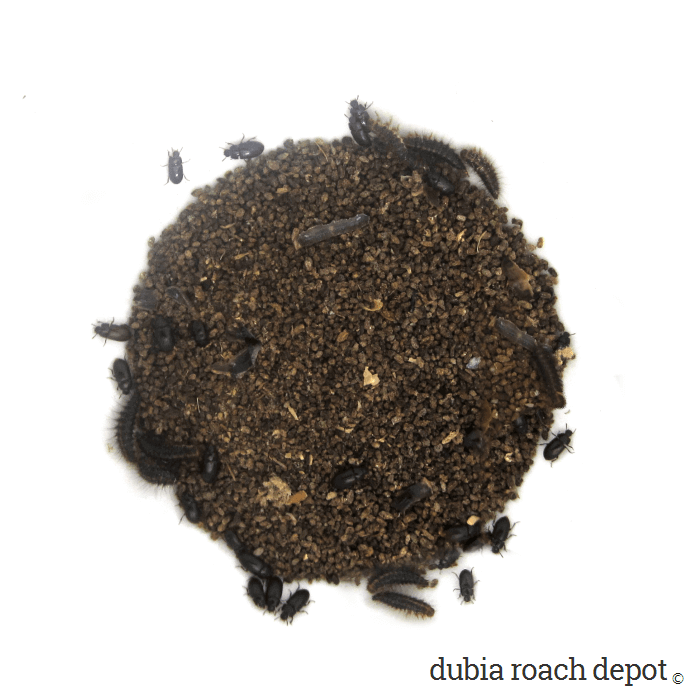 In return for becoming food for Dermestes after they die, Dubia roaches enjoy tidier surroundings, better health, and a higher survival rate. In return for picking up and clearing debris, Dermestid beetles and larvae get a reliable food source that increases over time as the colony’s population grows. This fuels their own population growth, thus forming a positive cycle. The Dubia’s success is the Dermestes’ success, and visa-versa. On the other side of this equation, lesser mealworms work in the background eating discarded food particles in frass and frass itself. This reduces moisture and helps prevent bacterial overgrowth. There is also a positive cycle here, but it has to do with frass and food. More roaches means more frass, and more frass means and food for the mealworms. While the number of cleaners in the Kits may seem small, they are proper for the job at hand for several reasons. First, these insects can do a lot of work. A few Dermestid beetles or larva can process a roach carcass in just a couple of days. Second, people tend to overestimate how many cleaner insects they need. More is not always better. The right amount is the number the natural die-off in the colony can sustain, and it is best to start with only the number of cleaner crews a colony can support. They will simply die off without food, and these insects reproduce fast when food is abundant. If there isn’t enough food to fuel population growth, they will wait until there is enough. This is to give you an idea of the cleaning capacity of the Combination Cleaner Crew kit right out of the box. It is roughly the number of kits a colony/enclosure of a certain size might need for immediate full cleaning capacity. It’s not the number of kits you need to buy for a certain colony size. You can start with one if you like. They will reproduce at a rate dependent on food supply. As noted above, about a third of our Combination Cleaner Crew kits consist of Dermestid beetles and larvae. These insects eat only animal-based foods, so you can count on them to scavenge dead roaches and undigested animal matter in frass. Because each insect picks up where the other leaves off, combining these two species provides a significant boost in cleaning capacity compared to either alone. Of course, this doesn’t mean you can neglect your roaches. You still have to check in from time to time to see how they’re doing. And cleaner crews require some care too. Though the effort is small and infrequent, it’s still good to know what they need, how they work, and what to keep an eye out for. Adding Combination Cleaner Crews can slow or stop the build-up of moisture and the bacteria in a Dubia roach colony. 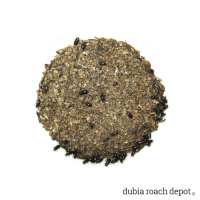 They make the job of cleaning and caring for Dubia roaches much easier. Your mileage may vary based on your location and and environment, but we’ve been very happy with this combination in our own Dubia colonies. NOTE: While typically right at home in Dubia colonies, either cleaner species could be considered a “pest” in certain circumstances. 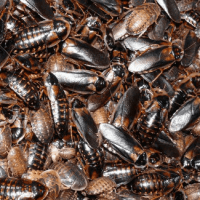 We’ve never heard of any problems from roach-keepers, but it can’t hurt to understand the risks and be aware of this. These beetles made a big difrence in my Dubia colony. They cut cleaning at least in half. I clean less often and the frass stays dry where before it was wet. I never thought cleaner crews mattered much. Now I highly recommend them.